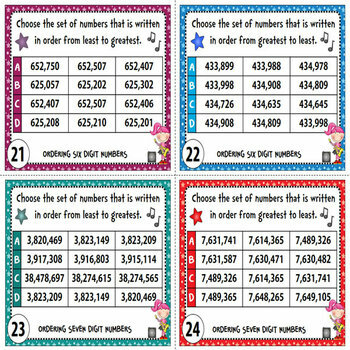 This pack contains a total of one hundred twenty (120) task cards divided into five (5) sets. 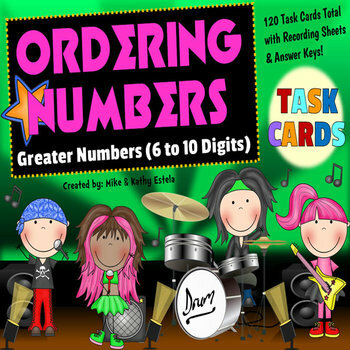 This is a great resource to help students learn or practice on how to order greater numbers (6 to 10 digits). 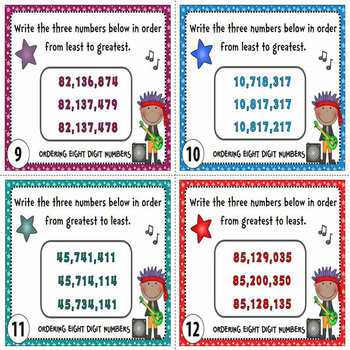 You may use these for individual practice, as a pair/group activity, or to use in math centers. We hope that you and your students enjoy this math activity. Our goal is to create quality math resources that will be helpful in your class instruction. If you found any errors/typos or have any questions about this product, please don’t hesitate to contact us at chilimath@yahoo.com. Thank you! © 2016 ChiliMath. The purchase of this product entitles the buyer a limited individual license and is non-transferable. This product is intended to be used by one teacher only. If you would like to share this math resource with your colleagues, you may revisit our TpT store and purchase additional licenses at a discounted price. This product may be printed or photocopied but may not be sold, transmitted, or put on the internet/intranet without a written permission from the authors. Thank you for respecting our work!